Pietro Longhi, whose real name was Pietro Falca, began his studies in Venice with Antonio Balestra and seems to have continued his training in Bologna with Giuseppe Maria Crespi, although this subsequent period has been questioned as his early work does not reveal the influence of Crespi’s style. Around 1730, living in Venice, Longhi began to specialise in depicting the lives and customs of the city’s wealthy classes in small format works that depict domestic moments. These simple scenes constitute historical documents that record a society through its customs, clothes and manners. Longhi’s approach and the mood of his works are remote from the style of other painters of everyday life of his day such as Hogarth, whose mordant satire he lacks, nor do we find the poetry of Chardin. In addition, Longhi’s artistic vision and temperament were far removed from those of Ceruti, whose Group of Beggars in the present Collection is a masterpiece of genre painting. Nonetheless, from an early date Longhi focused on themes inspired by daily life conveyed through an elegant, idealised approach. This small canvas was in a private collection where it was recorded by Ravà, who first mentioned it in the literature. There is no further mention of it for around fifty years until it reappeared on the London art market in 1971, the year in which it was acquired for the Thyssen-Bornemisza collection. The Tickle is highly characteristic of Longhi’s style. The scene takes place in an uncluttered interior with the green, damask walls that we find in other works by the artist, on which hang various paintings. The furniture and decorations comprise only a sofa and the heavy green curtains that cover a window on the left. In this tranquil, serene interior we see a young girl who looks out at the spectator and makes a gesture of complicity. 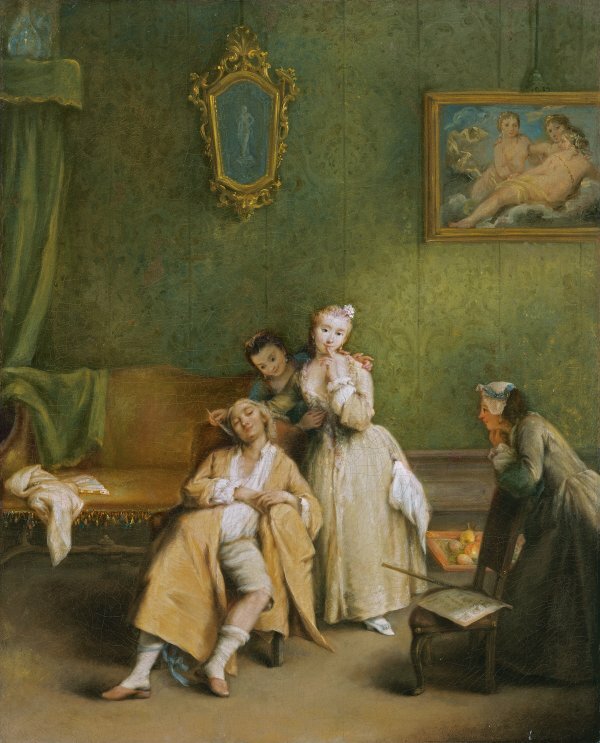 She tickles the face of a sleeping young man with a feather, attentively watched by two maids. Details such as the tray of fruit on the ground, the newspaper on the chair and the young woman’s shawl and fan on the sofa all suggest a moment of leisure and idle amusement. The pose of the young man, inelegantly sprawled on the chair, recalls that of the woman in the canvas entitled Fainting in the National Gallery of Art, Washington. 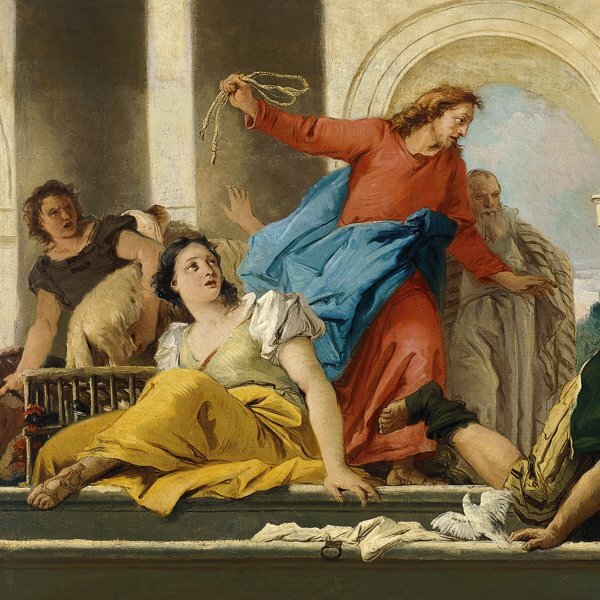 The painting has also been compared to others by Longhi such as The Lord’s Visit in the Metropolitan Museum of Art, New York, which includes the painting seen here on the background wall of the right and which seems to depict the Three Graces in a style close to Amigoni. There are preparatory drawings for figures in the present canvas in the Museo Correr, Venice in which Longhi studied the pose of the maid behind the chair as well as other details of the composition such as the young girl’s gesture of calling for silence and her face. The figures, whose poses and gestures suggest a theatrical scene, are painted in pale tones of yellow, white and green and are illuminated in a manner that makes them stand out from the room in which they are located.